Looks like launching a next-gen high performance electric motorcycle takes a good deal of funds. 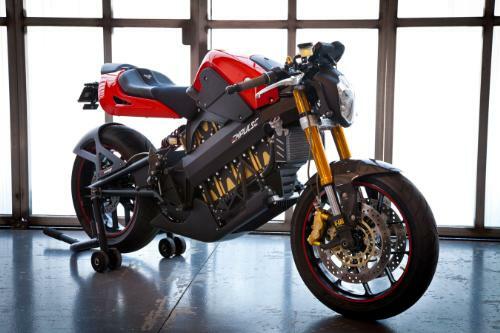 According to an SEC filing this week electric motorcycle startup Brammo is looking to raise $30 million, and has already secured $12.5 million of the round. Presumably at least part of the funds will go towards launching Brammo’s second electric motorcycle the Empulse (see photo), which is faster, pricier and has a longer range than its inaugural motorcycle the Enertia. Investors listed on the filing include Kuk Yi, Corporate Vice President and Managing Partner of Best Buy Capital, Brian Wawro, Senior VP at Canadian investment firm Chrysalix and Alpine Inc’s David Kurtz. Brammo raised another $10 million back in 2008. The Empulse will have a new battery pack and power management system, while employing a water-cooled motor (a first for electric motorcycles, according to Brammo). The technology reportedly emerged from Brammo’s racing efforts, which spurred the company to develop a lighter weight battery pack to achieve higher speeds. The top speeds and timed conditions of the raceway offers electric vehicle makers an opportunity to learn about safety and handling while refining their technology, and Brammo’s racing tech is now on its way into the production lineup. Designed to sustain speeds of up to 100 MPH and deliver an average range of 60 miles per charge, the base Empulse model is set to roll out in 2011 with an estimated starting price of $9,995. Versions of the bike with larger battery packs will go for $11,995 (for 80 miles per charge) and $13,995 (100 miles). This compares to the Enertia’s 60-70 MPH max speed, typical 40-mile range and roughly $8,000 price tag. At a time when electric car makers are racing to introduce lower-end models to expand beyond the luxury niche, Brammo is heading in the other direction to meet a demand among motorcycle riders for higher speeds and longer range.